The purpose of the event is to collect 10 inch ponytails for donation to Locks of Love (www.locksoflove.org) and specifically to benefit children with Alopecia Areata (www.naaf.org). Alopecia is an autoimmune disease that causes unpredictable hair loss with no know cause and no cure. 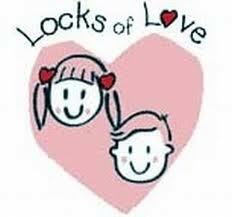 Locks of love also benefits children suffering from other diseases that cause hair loss such as cancer and other devastating diseases. Bring a miracle to a child - Confidence to last a lifetime. It is just hair to you and I but to a child suffering with Alopecia Areata, it means the world! Do you know someone with long hair? Watch for our latest date and call to schedule your appointment - 770-772-0510. Great 20/20 story about a former hair model who was diagnosed with alopecia & using her disease to inspire & help others.... click the link below to see the video!